The Gnoming Librarian: VOYA Day! I'm a library nerd. Yep. This shouldn't come as a surprise. I haven't tried to hide my nerdy side. I like libraries. I love them in fact. I love the smell of old books. I love wondering the stacks looking for the perfect item to take home with me. I love knowledge and information. And as a librarian, I love sharing my enthusiasm with others in the hope, that just maybe, they'll grow to love libraries too. I also love reading about what other librarians are doing. Taking ideas and making them my own, shaping them to fit my community. I love working in a field where I am inspired daily. That's not to say that insinuate that every day is fun. No. Not even close. As rewarding as public service can be, it is hard, and trying, and filled with long, long days and grouchy patrons. So every once in awhile you need a pick me up. You need something that will get you out of your funk and lift your spirits. 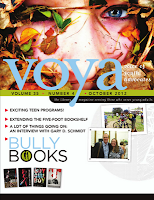 My favorite pick me up...VOYA day. Yeah. BIG NERD. 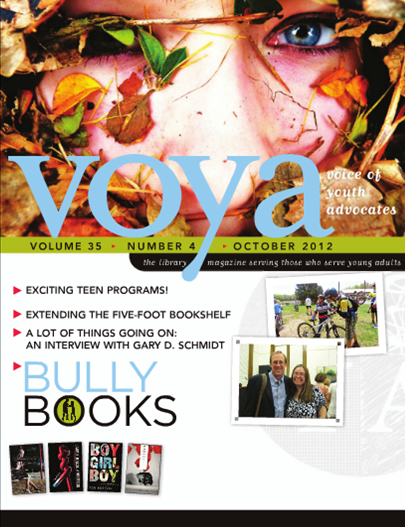 My favorite day is when the newest issue of VOYA (Voices of Youth Advocates) finds its way into my mailbox. It's a professional magazine! There are no pictures of celebrities. No fashion tips. No interesting editorials on the state of the nation or the destructive nature of party politics. There are book reviews. Program ideas. Discussions on ways to nurture teen development in your library. And I love it. Not sarcastically. Truly love it. In fact, my enthusiasm for VOYA day has rubbed off on other librarians in the building. The very quiet and reserved cataloger does a little whoop! when she delivers it to the second floor. A sing song version of "VOYA day!" can be heard coming from the librarians when they spot the magazine in my mailbox. It's infectious. Today was VOYA day. A day when I had three meetings, closed by myself, and had to deal with contractors who have difficulty communicating. So I'm snuggling in with my newest issue of VOYA, ready to be inspired by the creative, forward thinking individuals in my profession.